We went to London for a family vacation last week and had a blast. We did the typical touristy things like visiting the Tower of London, Harrods and Buckingham Palace but my favorite destination (by far) was Borough Market. It is a food lovers dream! Fresh produce, handmade pasta, amazing breads, charcuterie, cheeses, gourmet chocolates, prepared foods – they had it all. And we ate it all. We stopped by to eat lunch there three times during our week in London and never got bored with the offerings. We had scotch eggs, a roast pork sandwich, sautéed scallops, a duck wrap, gnocchi, and an ostrich burger. It is definitely worth a visit (or three) if you find yourself in the city. As much as I loved London, I can’t say the weather was too spectacular. It was cold, cloudy and gray almost the entire time we were there. I was happy to see the sun when we returned home. So, to rejoice in the sunshine, I decided to make lemon soufflé pancakes. These pancakes are light and airy with a pop of lemon flavor. One bite and you’ll be smiling. And don’t those ingredients remind you of happy sunny days? You can go all out by eating the pancakes with maple syrup but I find that a generous sprinkle of powdered sugar is enough for me. My sister gave me a big bag of meyer lemons from her tree a few weeks ago so get ready for more lemon recipes coming soon. In a medium bowl, whisk together cake flour, sugar, all-purpose flour, baking powder, salt, nutmeg, and lemon zest until evenly mixed. Set aside. In a large bowl, whisk together egg yolks, ricotta, melted butter, lemon juice, buttermilk, and vanilla extract until combined. Whisk in flour mixture until mixed through. Set aside. Beat egg whites with an electric mixer at medium speed until soft peaks form. Fold one third of the egg whites into the ricotta mixture until combined, then fold in remaining whites. Heat a heavy non-stick skillet over medium-high heat until hot (To test it, flick a little water into the pan. The water should skitter across the surface.) Lightly coat the skillet with non-stick cooking spray. Working in batches, for each pancake, pour about 1/4 cup of the batter into the skillet and cook until bubbles form on the surface and the underside is lightly browned, about 2 minutes. Flip the pancakes and cook until the bottoms are golden brown, 1 to 2 minutes more. Recipe from Gourmet Magazine, July 2005. The name of this intrigued me. They look so incredibly fluffy and souffle-like! Saving this one to try! Thanks, Nagi. These pancakes really are quite good! What a perfect stack of pancakes.. I would be a very happy person if I awoke to a breakfast like this tomorrow! 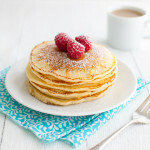 These pancakes look fabulous! I am the only one in my household, so I was wondering if I could freeze leftovers. I freeze regular pancakes and waffles on occasion. I have never tried freezing these pancakes so I can’t say for sure it would work. However, I don’t see why it wouldn’t work as long as the pancakes are well wrapped to protect them from freezer burn. I usually wrap baked goods in plastic wrap and then aluminum foil when freezing. The pancakes may also stick together when frozen, so you might want to put a piece of parchment or wax paper between them. I did have some leftover pancakes from this batch and had great success re-warming them after they had been refrigerated for a couple of days. To re-warm the pancakes, I heated a non-stick skillet over medium-high heat. Then I added the cold pancakes as if I were frying them again. Once the undersides were hot and slightly crispy, I flipped them over and cooked until the second side was hot and crispy. In your case, I would thaw the pancakes before adding them to the pan. Hope that helps. Let me know how they turn out for you.